Can I Achieve Multiple Positions Within a Conveyor Elevator For a Pallet Handling System? Increase elevator precision and achieve multiple positions within a conveyor elevator to handle pallets better in your clients’ automation processes with an electrical servo-driven VTU. lift a pallet to multiple precise heights to complete an operation. Let’s use an example of a window manufacturer who needs to cut glass to various sizes for window assembly. There are potentially ten sizes of window glass to choose from in the manufacturer’s automation process. Using a servo-driven elevator, the conveyor is able to precisely go to any of those ten positions to pull the correct window size for their frame for the assembly process down the line. Multiple conveyor elevator positions are especially useful for a pallet handling system that conveys products requiring a buffer or storage solution, including any type of curing or cooling operation, anything made in batch format that needs to be metered out, or any type of buffer for asynchronous process downstream. A lift is able to place these products in a storage setting for a set amount of time, and bring them back down (or up) when they’re ready for the next step. 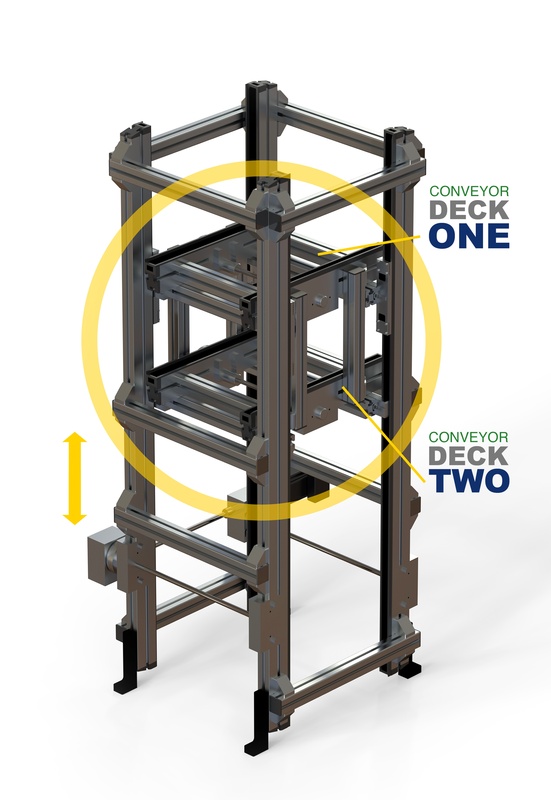 A multiple deck lift incorporates more than two lifts within one elevator footprint/frame. It incorporates in-feed from or discharge to two or more locations simultaneously. This is especially useful for processes requiring fast-paced throughput; we’re able to increase the amount of product being shifted vertically by two, three, four or more times – using as many elevators and additional lines as needed. Multiple deck lifts are used in situations where time savings and efficiency are crucial. For example, for a window manufacturing client we recently concepted a multiple deck lift with two conveyors inside. One went to the left, and one went to the right. Both lifted at the same time to push the windows onto two separate racking systems ten feet in the air. Another long vertical movement by conveyors moving in opposite directions transported the elevated windows to their destinations, all ten feet above the main line. 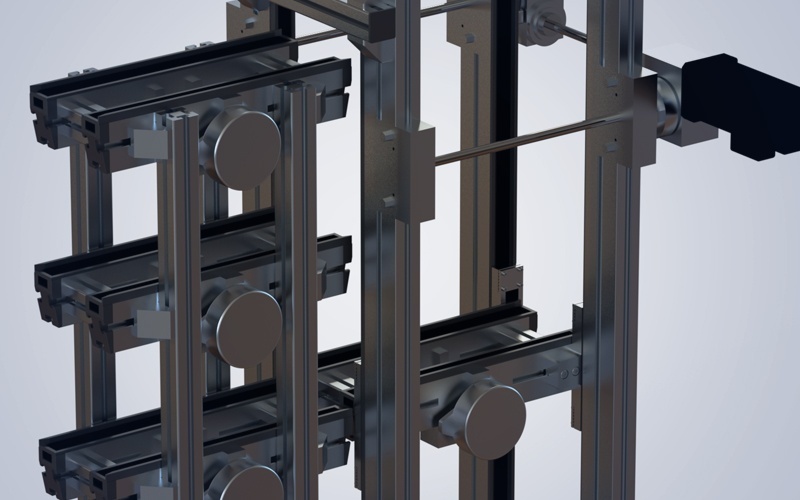 This exact solution could have been modified to add more lifts to support more products, whether products needed to be added to a racking system for curing or screws needed to be installed to a mechanism. Multiple conveyor elevator positions are especially useful for a pallet handling system that conveys products requiring an indexing buffer or storage solution, including products requiring a slow curing process such as glue setting before the next step in the process. A lift is able to place these products in a storage setting for a set amount of time, then rotate them down when they’re ready for the next step. Design engineers typically ask us about the exact capabilities of the lift when they’re looking for a solution to convey multiple positions. Since we’re able to quickly create a model of our servo-driven elevators in our software (IMPACT! ), you can literally have a 3D model in your hands to plug in and play within SOLIDWORKS to test in your automation process. You’re able to see the exact model we recommend, how it fits into your layout, and whether or not it needs adjustments if requirements change. Working with us, you can scale it to fit your needs. In our ebook Innovative Ways to Create Customized Lifts and Vertical Conveyors, learn more about customizing lifts and conveyors to achieve multiple positions and simplify your clients’ automation processes.